Films about lawyers and courts have been a staple diet of cinema for years and over that time, they have entered into a realm of clichés and predictability. So they have to bring something very special to make you stand up and take notice. 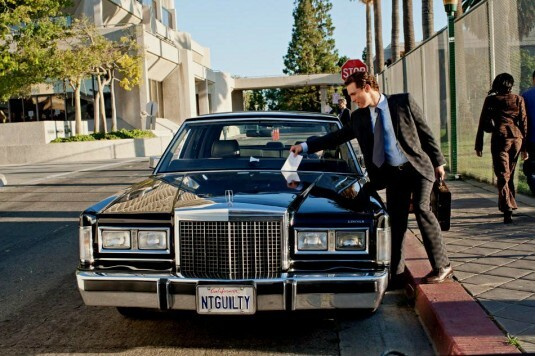 Luckily, The Lincoln Lawyer, based on a novel by Michael Connolly, manages to do just that. It also signaled the re-evaluation of a man’s career that led from rom-com hell to Oscar winner. Mick Haller is a smooth-talking lawyer who does most of his work being driven around Hollywood in a Lincoln. With a reputation for a man with no morals, he takes on the case of Louis Roulet, the son to a wealthy real estate agent, who is accused on brutally attacking a prostitute. It seems to Haller a pretty straight-forward case of the girl setting up Roulet to get her hands on some cash but as he digs deeper, he soon discovers that it’s not simple at all and that it will bring back old cases, affect his own moral standing and put his friends and family in danger. On paper the film sounds rather unremarkable. A well-worn plot device of the smart lawyer having to do a case which is pretty much open and shut has been used a thousand times in films, plays and on TV. So what makes this one stand out more than most? The fact of the matter is that director Brad Furman brings an edgy quality to the way it’s shot. Using the shaky-cam effect without making you feel sick is one thing to merit it, trying to bring a sense of realism to the procedure. He also plays around with visuals: flashbacks merge with the present; use of colour and lighting and multi-exposure, especially when Haller loses all control, work well to give the film a depth and interest. It would have been so easy to just point the camera and film but Furman experiments. The characters are more three-dimensional than most courtroom dramas. These aren’t just there for the sake of plot development, they all play an important part to the fabric of the story. Even down to the smaller, less impact parts and as you follow the events, you realise that the person who appeared fleetingly at the beginning is just as important to the mayor players who star throughout. Add to that a plot that twists and turns throughout. This isn’t a film you can leave to go to the loo. You have to play close attention. The performances, as you would expect from a cast made up of movie actors, not movie stars, is spot-on. Marisa Tomei, as Haller’s ex-partner and DA Maggie, is always a joy to behold, even if her role is not fully developed. Ryan Philippe is particularly unsettling as Louis, often questioning is he innocent or not and William H. Macy is always good value as Haller’s detective buddy. The whole thing wouldn’t work unless you get the casting of Haller right. A sleazy, sharp-tongued, snappy dressed lawyer who can come at you with cold, emotionless eyes, he is not a character you instantly charms you. Yet in the hands of Matthew McConaughey, this initially unlikeable slime-ball has you on his side as he battles with his judgements and morals. It proves what an impressive actor he is and having spent most of his career playing tanned cheesy romantic leads, it must have given McConaughey great joy to sink his teeth into a role like this. He scores big here and by the end, you are rooting for him all the way. So it has its moments where the creaking door of courtroom clichés flings open but it can be forgiven as you become embroiled in the complexity of the story. It also has one of the coolest soundtracks around and any film that kicks off with Bobby “Blue” Bland’s “Ain’t No Love In The Heart Of The City” is an instant winner for me.